To mark 10 years for Annual Earth Hour turn off your light from 8:30 to 9:30 p.m on March 25, 2017. A event to draw attention to the climate change and for people to do there bit to support the stand. The World Wildlife Fund WWF started Earth Hour in 2007 in australia and now have became a worldwide movement. About millions of people from 170 countries from all continents across the globe are taking part to highlight the global warming. In Sydney all the harbourside buildings switched off there lights, Empire State Building, the Kremlin, Big Ben, the Leaning Tower of Pisa, the Eiffel Tower and Egypt’s pyramids were other major momuments to participate by switching off there lights. 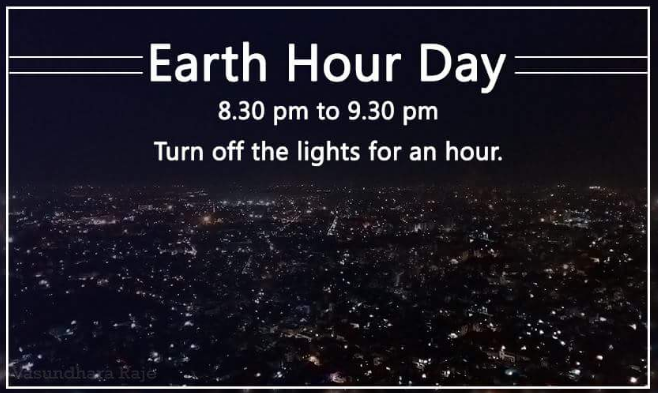 The event is held annually encouraging individuals, communities, households and businesses to turn off their non-essential lights for one hour, from 8:30 to 9:30 p.m. towards the end of March, as a symbol for their commitment to the planet. Earth Hour in 2017 is held on March 25.